Disclosure: This post is #sponsored by Cottonelle. All opinions stated are genuine and my own. Our family loves to try out new products, so when we heard Cottonelle (already a household favorite) was upping the game with a brand new wet/dry system, we were all in! The Cottonelle Fresh Care Flushable Cleansing Cloths Upright Dispenser and Clean Care Toilet Paper we purchased was huge, but if you want to start smaller, there are four other sizes for sale as well. The Cottonelle Fresh Care flushable cleansing cloths come in a handy well-sealed pack (unopened shelf life: 2 years), and each pkg. fits perfectly right into the handy dispenser that is included in the kit (you can purchase refill packs separately). The wipes are great because they dry quickly, have no alcohol, and can be used by the entire family. The one question my husband had was the clog potential these might present. Not to worry! Thanks to the Cottonelle Safe Flush technology, these wipes are listed as being septic and sewer-safe, and they immediately begin to break down once they've been flushed. The one-touch pull-out dispenser is great for keeping your wipes moist, nearby, and looking good in its sleek design that fits any decor (also comes in white). So now you can use the Cottonelle CleanCare paper, like you've always done and follow up with a fast-drying wipe when you're done. #LetsTalkBums Would you use the new wet/dry system? Most everyone wants to feel clean & confident. Cottonelle, with this new and very innovative product is certainly doing their part. As an added incentive to try the new Cottonelle Fresh Care Flushable Cleansing Cloths Upright Dispenser and Clean Care Toilet Paper set, head on over to their website, and claim a coupon for $1.50 off any purchase ($2 off if you share with three of your friends). Thanks for the coupon! We love Cottenelle wipes here! They are perfect for the little ones. I love. Cottonelle! I have not had a chance to try the wipes yet, but definitely will! We use the Cottonelle toilet paper and wipes combo in our house, too! It works great. I agree! We also use both in our house! I love cottonelle toilet paper! It is so soft! It's what I prefer in my home! We use cottonelle wipes.. thanks for the coupon! Awesome...thank you for the coupon!! Cottonelle has great products and it's what we use as well. I love the wipes too and that they're septic safe and flushable. That sounds like a great product. My three-year-old uses wipes when he goes potty. Thanks for sharing this. Have a terrific night. I've heard of wipes like these. Not sure if they'd quite be right for me, but a good product if it works for ya. Thanks for the coupon! We use the wipes in our house and can always use coupons for them! Really interesting! I have never seen a wet/dry system before. I am glad that they don't clog up - I even have that problem just with thicker toilet paper! Love this brand! It's the only brand we use for TP. I have used both the cottonelle toilet paper and wipes and have to say it is a great combination. Our family loves new products too! Thanks for sharing about cottonelle! Those wipes are lifesavers. Okay probably not lifesavers exactly but they are undie savers....lol. I keep some in my sons bathroom. I keep diaper wipes everywhere! They come in handy for so many things. I'll have to try these! I tried this cottonelle routine and it convinced me that extra clean is very good. Thanks for sharing this article with us. Im going to have to try those wipes sometime. I will have to make a point of looking for the wipes... Thanks for posting. We use the flushable cleansing wipes in my house! We have always loved and trusted cottonelle! Cottonelle looks like a great wipe. They also offer good coupon deals. We love Cottonelle products. Your cutie is adorable! He is so cute...the Cottonelle package looks almost as big as him. Adorable!! Thanks for the coupon. Always looking for ways to save some money. This is a great brand. It's the one we use. I love that the kit includes the dispenser. It allows everything to be a little more discreet! 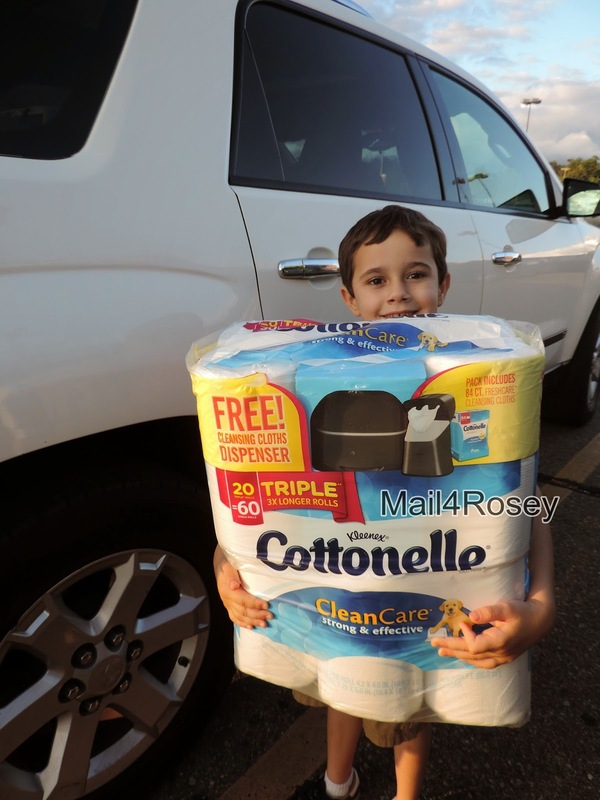 Hahah you have to love it when the toilet paper package is almost as big as the kids! I love Cotonelle so smooth and the dispenser is a great bonus.. I love those flushable cleansing cloths - great for kids! I'm sooo excited and totally love the Flushable Wipes, they are the best for at home and on the go.... and Cottonelle has always been a family favorite. We use this. I love the one-touch pull-out dispenser! Cottonelle is one of our favorites, will have to keep an eye out for the package with the dispenser. Thanks for the coupon, too! We love Cottonelle and the flushable wipes are great with kiddos! Our bathroom is never without these products! Yeah my favorite brand! We use the toilet paper and the wipes! Our family started using the clean routine a few months ago and haven't looked back sense. I love this! I've been using baby wipes for years. It's nice to see a grown up product for getting uber clean. That's exactly how I shop! Huge quantities of Cottonelle! We just loaded up on Cottonelle this week! We always grab it in bulk. What a great high value coupon. We by our TP at Sam's so it is in big old bags. I will have to try these new products out. Cottonelle is our paper of choice! QUALITY PRODUCT! Cottonelle is a great product and one that we have in every bathroom in our house. I especially love the wipes. I always use wipes after the restroom. We don't use Cottonelle, however, I'd be willing to give it a try after this awesome review! We use Cottonelle from time to time. I haven't tried the wipes yet. I like the one-touch pull-out dispenser. Would really be useful in our home. Need to use the coupons so I can pick up a few cottonelle products. I really LOVE Cottonelle! 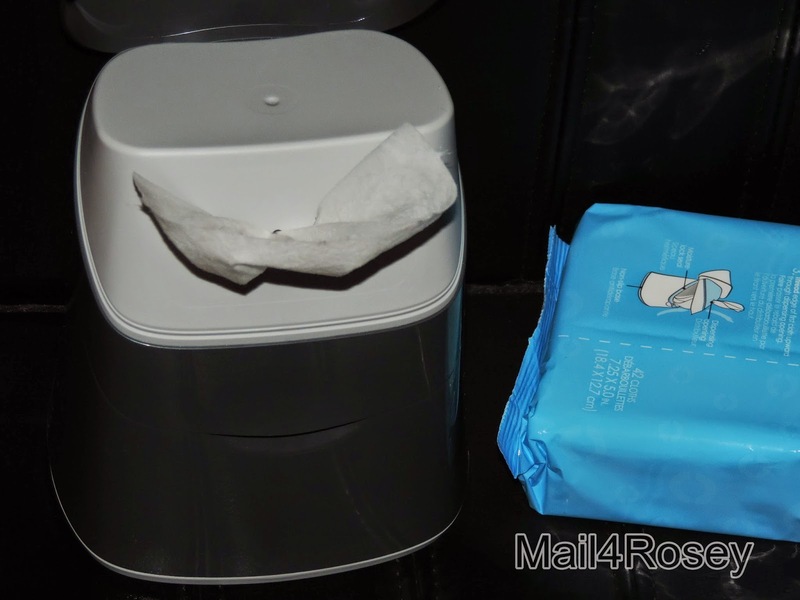 Especially their flushable wipes, they're SO handy and a must in my house now! Ahahaha! That toilet paper is almost as big as him! I do love the Cottonelle brand. As an Ulcerative Colitis sufferer, I have to be picky about the tp and wet wipes I buy, and they are at the top of my list! Thank you for including pictures of the Wet device. I've been wondering how exactly it worked. I love the new Cottonelle dispensers. I have one in every bathroom! I like this idea too. It is helpful - especially when your cat likes to knock the rolls on the floor! This is great for hotels to have in their toilets. For sure, customers would want to visit establishments that have good sanitation. Thanks for the coupon. I love having wipes available wherever we go. We use Scott brand products for the most part, I could be persuaded to use Cottenelle if the price was right. Adorable! I love the picture. Cottonelle is a great brand. I've been wanting to try the wipes. I'll have to give them a try! We have those in a smaller container. I like that they look tidy in the bathroom. I have really been thinking about adding the flushable wipes to our routine. My son is potty trained and is learning to wipe, but he doesn't quite get everything back there, lol! I didn't realize they had wipes! I'll have to give them a try. I've never used this brand before. We'll have to give it a try. Thanks for the coupon. I've been meaning to try those wipes! Glad that you liked them! I love cottonelle. It's one of my favorite brands though I haven't tried the wipes yet but I will def have too!!! We have used Cottonelle for many years and now use the wipes. If I was starting a family these would be in our bathroom for sure! Holy moly that's a lot of Cottonelle! And I had no idea that they came in flushable wipes now too. Those could really come in handy sometimes. Like this brand and buy when in need. Thanks. We love Cottonelle here. I have been addicted to the wipes since trying them out a couple of months ago. It really does make a difference and it wonderful with kids. I'll have to try these. Wipes are so handy. Thanks for sharing the coupon, too bad the product is not available from where I am! Cottonelle definitely makes great products! Thanks for a great post! I Cottonelle Wipes great addition to tissue! I love this brand too! We love our Cottonelle booty wipes! We have them in all bathrooms and travel with them. I love the idea of having these wipes in the bathroom along with regular toilet paper. It means that it will be a cleaner and fresher experience. I love that they have a coupon and especially for a hefty amount like that. I always buy it in big packs like you got too. I love the coupon too. It will really come in handy and cottonelle makes such great products. I used to use Cottonelle, not sure why we don't any more. I let my Hubs do the picking of the toilet paper. Thanks for the coupon, it just might entice the Hubs to try Cottonelle. We do not have this brand here but I would try it if we did. It seems like a lot of wipes with contelle, Also I like the brand it has nice quailty! Cool! I've been wanting to try these for a while now! 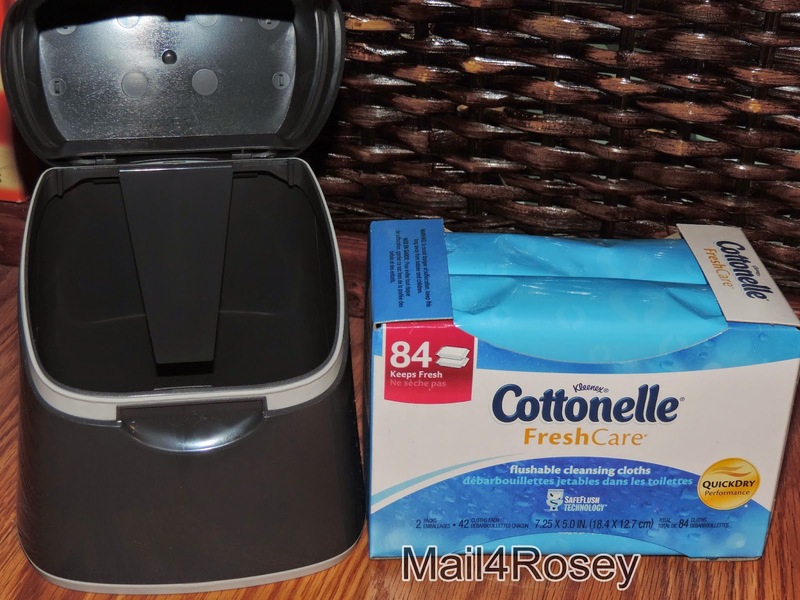 I used Contelle with croudtap last year I got one of the smaller dispensers and the wipes. I really enjoyed having the wipes handy it helps when you have a special needs 7 year old who has trouble remembering to wipe when she goes to the bathroom this helped remind her to wipe not only herself but her hands with another wipe anything to let the kid pull it out of the dispenser I think they could make more creative kid friendly looking wipe dispensers and it would really be a hit. I was skeptical of the wipes but once I used them, I loved them. I don't go without them in my bathroom. The dispenser is really discrete and can easily be displayed where ever you want. I love the Cottonelle wipes. This looks like a great system! I make sure I always have the wipes in every bathroom and even take them on vacation! I'm totally digging the dispenser because I get so grossed out when I think of whats lingering on my flushable wipes as it is. Love this. We love the wet wipes and keep them in our car for spills. We also keep them in the bathroom, of course. Looks like a great product. Thanks for sharing the coupon. Seriously, all we use is Cottenelle! Best value for the money. Glad there's a coupon! Haha, that package is almost as big as he is! :) We love our clean routine. I love using Cottonelle products. The sack of Cottonelle is almost as big as him. lol Thanks for sharing. I buy Cottonelle wipes and toilet paper. It is the only brand my whole family likes. Great value too! Yes, I would, and do now, new Cottonelle wet/dry system. I don't feel clean unless I use them. I don't have one of the new dispensers yet, it is on my list for my next shopping trip though! I absolutely love Cottonelle. They are a great product. I am going to try these. Haven't tried cottonelle before but might have to now. I love this brand of TP. And the moist wipes are so handy! Love Cottonelle! Hubby accidentally bought the wrong brand the other day and I sent him right back to the store. 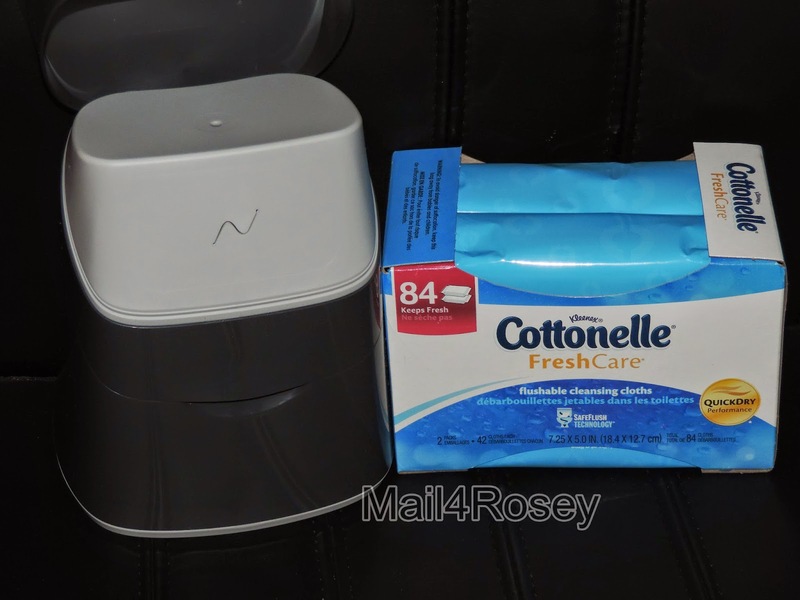 Cottonelle Fresh Care Flushable Cleansing Cloths Upright Dispenser and Clean Care Toilet Paper option sounds great, and for ppl traveling or going out for the day with a little one, the small packages are perfect!